I haven’t cried smiling at an art performance in such a long time. So now I’ll be dedicated to making sure everyone I know knows who you are. Thank you Puddles. This has got to be the most relevant song in United States right now. Pardon the typo above… Just wanted to add that I saw Puddles perform this song live. His singing, musical arrangment, and film combined took took the song to a whole other level and the experience was well worth the effort it took to catch the show. When are you next coming to the UK?!? Edinburgh was one thing, but you really need to pick up some venue dates! My MIND has been thinking about YOUR MIND. In addition to your monumental singing talent, you’ve created the perfect character. No need for hair, make-up or wardrobe people. Or even a band. Easy, right? Your age doesn’t matter, your gender doesn’t matter, how you look doesn’t matter, your weight doesn’t matter. And you’ve created a PERSONA with an emotional viewpoint that MOST people can love and relate to. Ok, maybe not the clown-a-phobes, But you’re even breaking them down. You’ve stripped it down to talent, creativity and emotion. How wonderful is that? And how brilliant is YOUR MIND? Thank you! I couldnt have said it better……..
Have you looked at the Kinks catalogue? You and Ray Davies have a sense of irony. Look out for i-rons. Start with Kinks album Arthur. And P, one more thing…..you don’t speak, so it saves those golden pipes!! See u in Red Bank, NJ. Can’t wait for my hug! I love all your stuff. Loved you on AGT. Can’t believe you have not taken a stab at PINK FLOYD-COMFORTABLY NUMB. I am amazed at all your song and your take on them. Wow, way to put a Stamp on my soul! Loved this in all its forms. I would love to hear you do “Delia” by Johnny Cash. Puddles< my wife and I attended your show in Concord, NH. just last night. I wanted to stop by and tell you how much we enjoyed your performance, and how good it made us feel. We are all ready to buy our tickets for next year in hopes you will please come back. I listen to your music nightly when I get home from work, generally while doing yoga. Wish we could have stayed for pics and cuddles, but the wife had to be up by 4:30 and you had quite the line of folks waiting to see you. I don’t hit women. That is very important in this day and age. My grandmama and my mama taught me how to be a man. I tried to hit your Troy NY show, yet I can walk, but my father is a wheelchair guy. And there was no love. Love and keep it up! So very nice. I would like to suggest a seasonal song. Ed Ames, one of the Ames Bros and also played Mingo and the Daniel Boone tv show, recorded The Christmas Donkey. Its about the donkey who carried Mary. Please at least just listen to it. I can imagine you . Another : John Denver’s Calypso. Puddles, this has to be my favorite, so far. I’ve just recently started listening to you. I was instantly struck by the realization of your persona as Caruso as I watched the Youtube video of America’s Got Talent. I stumbled on it after listening to Disturbed’s version of Bridge Over Troubled Water and then your videos popped up. What joy! Thank you for bringing humor back into dark lyrics. Algeria love you and africa too love you. We love your songs, your singing style. I was shocked when you was disqualified from the America’s got talents. good luck. you are the best. 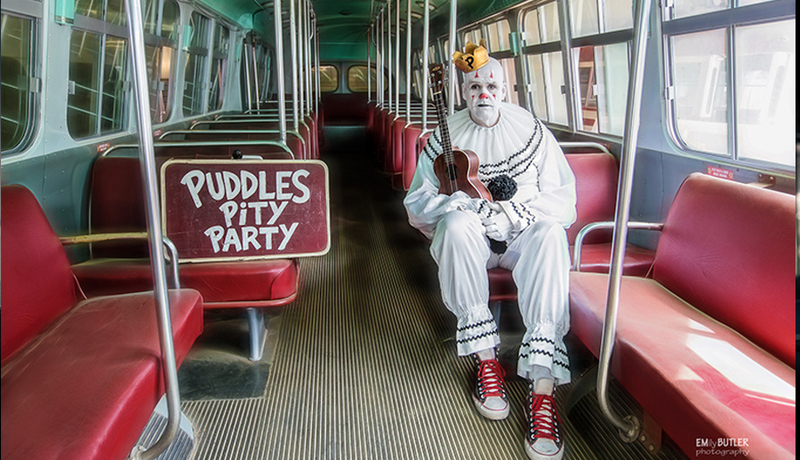 Hi Puddles, I became an instant fan of yours after seeing you on AGT, I am still sad that you did not make it further. I was delighted to find out that you are coming to Minneapolis MN, at the Pantages Theatre, March 24, 2018. I have already bought my tickets to see you perform. Hoping I can get a Puddles Cuddle after the show and maybe a picture. Can’t wait till March, keep singing those wonderful cover songs. Beautiful job singing this song Puddles. With such an awesome voice that you have, why don’t you write and sing your songs or do you? Love your style, love your Voice, Love everything you do! Please keep on singing an make the World a better Place. This is one of my favorites ever. Gorgeous use of your voice! Have you ever considered doing Leo Sayer’s “The Show Must Go On”? I think it would be amazing. Saw you in Atlanta at center stage last night. Had no idea what to expect. You knocked it out of the park. It’s the best show I’ve ever seen. You’re hilarious and your voice is unsurpassed. Cannot wait to see you perform again! I’m not sure if it is really your style, but I’d love to hear you take a shot at “49 Tons” by Fred Eaglesmith. Amazing….what else can I say. Love Ya! I love the drama that is Puddles. I love your facial expressions, sense of humor and your overall ability to touch the deepest part of my soul with your voice, ( in a good way ). I want to thank you for being YOU! What a talent…cant stop watching for whats next….please come to N.H. Please have a crack at this, true it’s darker than you usually do but I think it could work. Saw an interview with the singer of the Pixies. He said he wrote the song after going scuba diving. It explains some of the lyrics. This is fantastic Puddles – I love the Pixies and from finding this on YouTube, I’ve just spent the last hour or so with my four and six year old sons enjoying your videos. Do you take requests? I’d be fascinated to hear your take on a range of tunes! – select tracks from Talking Heads, The The, Devo, Blondie, B52s, Verve and so on! 1) I’m extremely coulrophobic, so when I heard about your incredible voice and great covers I listened without watching. Brilliance. Absolutely brilliance – your rendition of I Want You to Want Me makes me feel things I didn’t think I was capable of feeling (mostly good things). I knew I was missing out on great performances by not watching your videos, but I avoid visuals of clowns, jesters, harlequins, calaveras..KISS…as much as possible. Who needs the drama of confronting their fear when their fear is clowns? So I miss out on Pagliacci McDonalds, not a huge loss, right? 2) I’ve been a Pixies superfan since 1987 ish and as most superfans are about their idols, I am very (very) protective of the Pixies’ music. There are some great covers (especially of WIMM) but I always go in skeptical and with a “you better watch it…” attitude. 3) Puddles, you gave me the chilling thrill I heard the first time I heard Where Is My Mind. And that’s saying a lot, because this is one of those “it changed my life during my formative years” songs. 4) I finally decided to grow up, get over it… it’s a clown, deal with it. I summed up my courage and watched this video. I’m not saying you cured my coulrophobia…but…I am feeling stronger and am compelled to watch more videos of your covers that I’ve been enjoying for the past few years. I’ve been missing half of the brilliance that you possess, a nightmare or two is well worth the risk. Oh, and…is Nights in White Satin too obvious and too often requested? Asking for a friend.